Gareth Bale got himself on the scoresheet for Real Madrid in their Champions League tie against Roma this evening with a wonderful team goal. 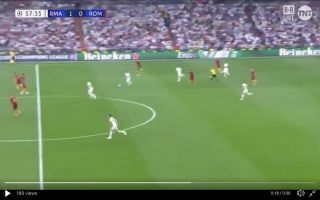 In the 58th minute of the match Real Madrid won back possession from Roma and midfield maestro Luka Modric played a magnificent through ball into Gareth Bale’s path who used his lighting speed to run towards the Roma goal before hammering the ball into the bottom corner. Modric’s vision and passing ability is a joy to behold and it is no surprise the former Spurs midfielder is now regarded one of the best players in the world. Gareth Bale scored the 18th Champions League goal of his career placing him in the history books alongside legends Ronaldinho (18) and Francesco Totti (17). Gareth Bale may be the key to Real Madrid lifting the Champions League trophy once more this season.